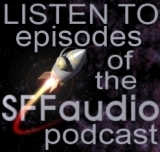 The SFFaudio Podcast #070 – Jesse and Scott talk about the most recent arrivals and the latest audiobook releases! The Big Time by Fritz Leiber, public domain, Brilliance Audio, Audible Frontiers, Scott Danielson’s Audiobook Fix, Fafhard And The Grey Mouser, Death’s Excellent Vacation, a new Sookie Stackhouse book, Charlaine Harris, True Blood, HBO, George R.R. Martin’s blog, A Game Of Thrones, “fat fantasy”, The Stand by Stephen King, the preface to The Stand: The Complete & Uncut Edition, Stephen King’s version of Hansel And Gretel, “getting lost in the world”, reading for ideas, characters are not ideas, The unexpurgated version of Robert A. Heinlein’s Stranger In A Strange Land, novelists are writing to the width of the supermarket paperback rack, Allan Kaster, as ebooks become more common book lengths will vary more, Outlaw Of Gor by John Norman, the movie version, Palimpsest by Catherynne M. Valente, the meaning of palimpsest, Aasne Vigesaa, Day By Day Armageddon: Beyond Exile by J.L. Bourne, The Stainless Steel Rat by Harry Harrison is coming to audioook!, funny old Science Fiction, comics, Crossed: Volume 1 by Garth Ennis and Jacen Burrows, George Romero’s The Crazies, the 2010 remake of The Crazies, the “trixie virus”, the Reavers from Firefly, The Omega Man, I Am Legend, The Last Man On Earth, Upcoming Readalongs:, Assam And DarjeelingEarth Abides by George R. Stewart, Connie Willis’ introduction to Earth Abides, The Dying Earth by Jack Vance, Strange Case of Dr Jekyll and Mr Hyde by Robert Louis Stevenson, going off the rails, the Michael Caine version of Dr Jekyll and Mr Hyde, Wayne June, Charles McKibben, The Essential Dr Jekyll and Mr Hyde: The Definitive Annotated Edition edited by Leonard Wolf, Scott’s Pick Of The Week: Netflix Streaming, Netflix is coming to Canada, there should be a Netflix-like service for comics, Jesse’s Pick Of The Week: Crossed: Volume 1, (get issue #0 FREE online |HERE|) you have to slowly build up your tolerance for Garth Ennis, “horrifically visceral”, DC Comics Hitman, DC Vertigo’s Preacher, War Story, Battlefields, The D-Day Dodgers, Neil Gaiman, The Sandman. Garth Ennis’ Crossed looked really disgusting when I paged through it in the store. I’m sure Blair Butler of Fresh Ink ( http://g4tv.com/freshink ) would love it though. Hey that show looks pretty good! Thanks very much Tam. I’ve now subscribed to the podcast feed.